Scientific breakthrough: Almost all doctors are healthy! This is marvelous--an Alice-in-Wonderland-like optical reflection of the "my patients are sicker" standard line from doctors. Medscape has published a "Physician Lifestyle Report," in which doctors self-report aspects of their lives. The report presents data from more than 30,000 US physicians. 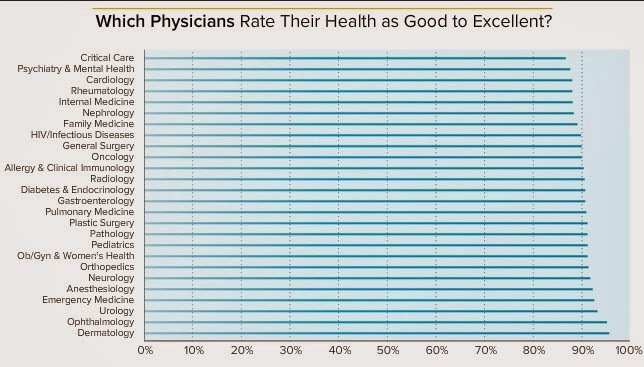 I know you will be happy to learn that the vast majority of doctors rate their own health as good to excellent. 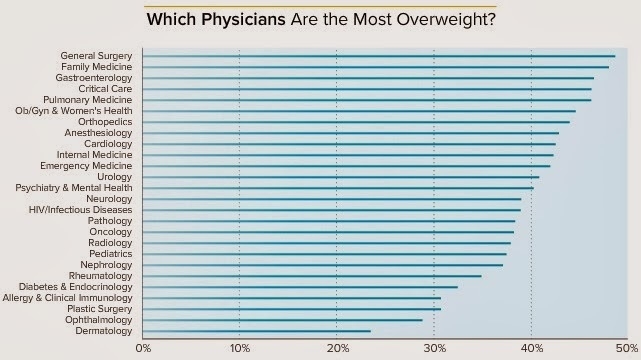 But there seems to be some denial involved among up to half of the same doctors, as we can see from this chart, in which they report on one commonly used metric of good to excellent health, whether they are overweight. This all seems to present a weak case for mindfulness about themselves, no? Speaking of the rest of us, here's how people in the US view their health status. (Source: 2010 Census.) Overall, 90% of us, too, think our health is good to excellent, although the percentage varies by income. 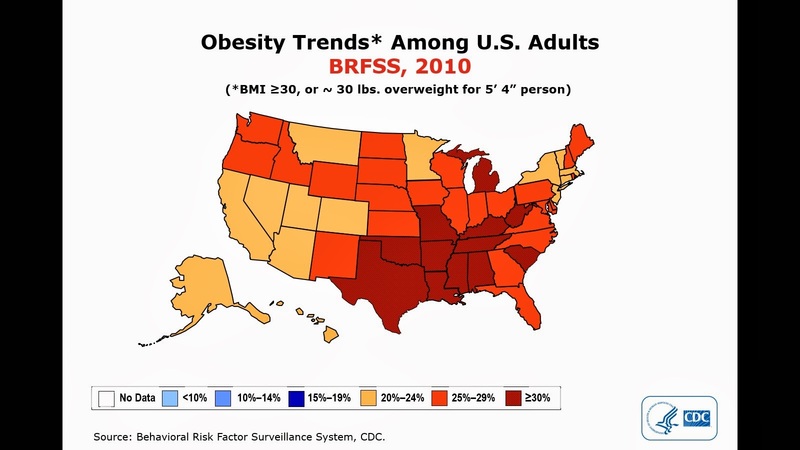 But, like the doctors, we are delusional on the overweight issue. 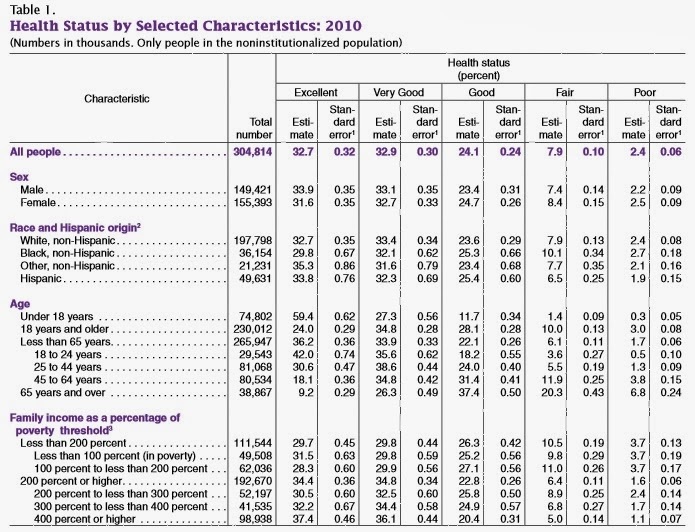 Here are the CDC numbers for the same year as the Census, 2010. There was a 13% decrease in the incidence of concussions among NFL players between 2012 and 2013, league officials announced in a press conference here. During 2011, there had been a total of 252 concussions overall, and during 2012 the total was 261. The total fell to 228 in 2013, Miller reported. Wait, first the number went up between 2011 and 2012, and we're using that higher number of the base for comparison? I know they are trying, but I don't know, it still seems like a lot to me. But probably more important than anything else is that they've reduced full contact hitting during practice to less than once a week -- a total of 14 times in an 18-week season. No other level of football -- college, high school, youth -- has that little amount of hitting. In an ideal setting, the clinicians on the field should have no financial relationship with the teams. Instead, they should function as independent observers similar to referees. This model would take out the conflict of interest. Removal of any conflict of interest in the medical management team. This means that a medical decision by the athletic trainer or physician must be driven only by the medical interest of the injured athlete, and there should be no influence by coaches or other nonmedical staff. Look, the country now watches the Super Bowl more for the ads than the game. We don't need a league that continues to hurt more people than is necessary. MD likes patient feedback. Says it makes him do better. BBC: Surgeon explains why being rated + reviewed “like a hotel” makes him a better Dr and weeds out substandard care. Many, many thanks to Dr. John Corboy* and his colleagues at Neurology Clinical Practice for their decision to provide free and complete access to the public of their recent editorial on recommendations to increase the incidence of concussion reporting by athletes, along with the underlying article that supports the recommendations. As I mentioned the other day, the journal had a number of important recommendation on this topic, but wide scale dissemination of those recommendations was being held up by the journal's subscription requirement. Now, these thoughts are there for the world to see. Please take a look! Equally important, let's see if we can now all act on these these thoughts. People inside and outside of the University are curious to see how the Board of Trustees handles this issue. They remember that the previous President of the University and many of the Trustees were forced to leave office after the Chicago Tribune published an expose in 2009 about favoritism in the admissions process. The current board contains many luminaries, including the former U.S. Attorney, Patrick Fitzgerald. It is inconceivable to me that people of the moral character of Mr. Fitzgerald would stand idly by in the face of this kind of misbehavior. While we should grant the Board appropriate time to reach a conclusion, it would certainly raise public confidence if they were to at least announce that they were investigating this situation--and, more importantly, the kind of environment that would lead to approval of these kinds of advertisements. To do so, the Trustees need to conduct an independent appraisal of the Department of Surgery. What kinds of financial support, direct or indirect, has been given to the faculty by the firm sponsoring the advertisement? You can't just look at consultant payments. You have to go further and look at support for research laboratories, equipment, and the like. By covering such expenses, more funds can be made available for salary support and perquisites for faculty. You also have to look at conferences in other locations, where UI faculty may have received honoraria, travel expenses, and the like at resorts and other meeting places, conferences which themselves were the result of corporate sponsorship. Perhaps the University, too, should examine why the surgical residency program at UIC is currently under probation by the ACGME, the national accreditation body. This is a huge embarrassment for any institution, but especially one of the prestige of UI. I'm betting that part of the reason is that surgical residents do not get enough time actually participating in the use of its surgical robots. How ironic that the department's emphasis on this technology might be the very cause of a lower programmatic standing. Probation can cause prospective residents to choose other training programs, weakening a department for years to come. Of course, the person who would have most interest in the status of the residency program is the Dean of the College of Medicine, but we have already discussed his own conflicts of interests, serving on "one of the highest-ranked pharmaceutical and healthcare companies by sales in the world." Perhaps the University might request the person with oversight of the Hospital and Health Sciences System, the VP for Health Affairs, to explain whether he was ever informed of the Dean's outside activities. Perhaps the University should review the travel schedule of the Dean to see whether his "duty of care and loyalty" to Novartis--a condition of membership on that board--has ever conflicted with his obligations on campus, in terms of missing important meetings or other University obligations. [T]o oversee the structure and functioning of the Board of Trustees and attend to matters involving its members, and to ensure a proper "tone at the top" including definition of and compliance with proper standards of ethical conduct for the board and University personnel. According to the Trustees' website, the next meeting of this committee was scheduled for February 17, but that session has been cancelled. I wonder, then, when the work related to this current issue will be discussed. As far as the rest of the world is concerned, the silence is deafening. A surprisingly engaging, malfunctioning sign at the Port Authority Bus Terminal in New York City, complete with background accompaniment. The next WIHI broadcast — SBAR, Structured Communication, and Psychological Safety in Health Care — will take place on Thursday, January 30, from 2 to 3 PM ET, and I hope you'll tune in. A few key concepts are ubiquitous in the world of health care improvement, and one of them is most definitely SBAR, an acronym for Situation-Background-Assessment-Recommendation. We have the Navy to thank and Kaiser Permanente’s Doug Bonacum and Suzanne Graham, along with Dr. Michael Leonard, for migrating this structured communication framework into the world of health care more than a decade ago. At its core, SBAR is a way for health professionals to effectively and succinctly convey critical information to one another to protect patient safety. Over time, SBAR has proven useful in a myriad of other ways as well. Still, how might we evaluate the utility of SBAR to advance today’s quality improvement and patient safety challenges? Has its singular power to “cut to the chase” eroded over time? These questions and more are on tap for the January 30 WIHI: SBAR, Structured Communication, and Psychological Safety in Health Care. Jill Morgan and Ansley Stone are nursing and quality leaders who can’t imagine health care today without SBAR. They point to the critical role that SBAR plays in ensuring safe care for pregnant women undergoing labor and delivery, and in drawing attention to any patient or staff situation that requires immediate attention and decision making. What’s your experience with SBAR? How might it be strengthened for safety work over the next ten years? How can SBAR become a solid communication tool for improved handoffs or enhance newer processes, such as daily safety huddles, to achieve what Michael Leonard calls “psychological safety” among all staff? I hope you’ll let us know when you tune into WIHI on January 30. Bring everyone you can think of in your organization who uses SBAR just a little or a lot. See you then! My passion for youth sports coaching has led me to several articles on this blog about the dangers of concussions, sensible practices that should be followed when players are hurt during games, and sometimes about the poor behavior demonstrated by some coaches. Somehow, though, I missed an article from August 2013 in Neurology Clinical Practice by Daniel M. Torres and his colleagues from NYU's Department of Neurology and others. * It offers some insights that should be recognized and understood by coaches. Studies suggest that a lack of standardized knowledge may lead to underreporting and undertreatment of sports-related concussion. However, there has been little work done to establish how this knowledge may affect athletes’ behaviors toward reporting their concussions and removing themselves from play. We conducted an anonymous online survey to assess athletes’ knowledge of signs and symptoms of concussion, and also sought to estimate the potential frequency of underreporting in a collegiate athlete cohort. 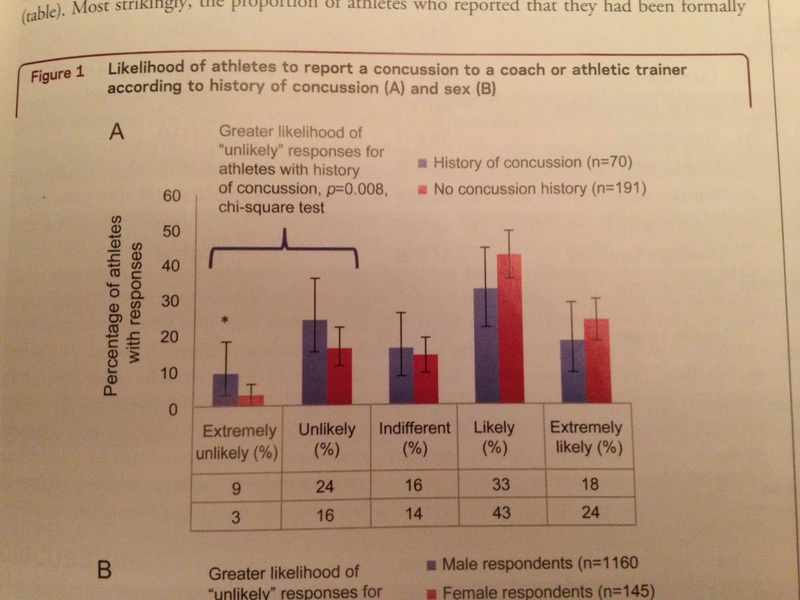 Among 262 athletes who responded to the survey, 43% of those with a history of concussion reported that they had knowingly hidden symptoms of a concussion to stay in a game, and 22% of athletes overall indicated that they would be unlikely or very unlikely to report concussion symptoms to a coach or athletic trainer in the future. These data suggest that there may be a substantial degree of underreporting of concussion among collegiate athletes, despite most acknowledging that they have been formally educated about the risks of concussion. You might think that these athletes' previous experience and knowledge would make them more likely to report concussion sysmptoms, but no. Should we be concerned? Absolutely. Concussion is not a singular event, but rather a pathophysiologial process that can threaten the physical and mental health of the involved athlete. There are many potential reasons for underreporting that needed to be addresses comprehensively by all governing bodies of sport in a consistent and enforceable manner. 6 -- Student-athletes need to embrace a culture that demands that their safety, excellence, and wellness are always the top priority. The authors also note that, "if neurologists and sports medicine physicians are to become part of the solution, they must also be at the forefront of understanding the problem." They then offer a list of actions to be taken by the profession. We have made considerable progress, and must not lose momentum. Torres et al. soberly remind us that we still have much work ahead of us. Indeed. Well presented and well argued. Let me publicly ask one more thing of the publisher and editors of this journal. Please change your website to let these two articles be available to the thousands of coaches and parents and players around the world who need to read it. By restricting its circulation, you are undercutting the very recommendations you make. * Disclosure: The lead author is my nephew. 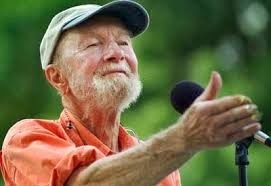 Pete Seeger is gone. There will never be anyone comparable. The New York Times has published a fascinating story about the successes and tribulations of Uber, the digital taxi company. To me, the really interesting part is the portrayal of the founder and CEO, Travis Kalanick. I don't want to overstate this, but Mr. Kalanick embodies some characteristics of the "digital generation" that are problematic. Specifically, while his digital skills are unquestionable, his interpersonal skills might need some work. Mr. Kalanick, who is brash and aggressive even by the standards of Silicon Valley, created Uber four years ago to blow up the traditional taxi business. In more than 60 cities, from San Francisco to Berlin, it is doing just that. Anyone with a smartphone can use Uber’s software to get a ride. . . . For that achievement, Uber is valued at $4 billion. There have been some recent incidents, though, that raise questions about aspects of the company's business model and, in particular, its assertion that its service should not be regulated by traditional hackney licensing boards. Mr. Kalanick agreed to talk to a reporter about these matters, but apparently he did not fully understand the way a CEO might want to talk to a business reporter. In a testy interview at Uber’s offices here, Mr. Kalanick declined to discuss the accident except in the most general terms. Whew, what a way not to give a positive impression of a caring company! The San Francisco Cab Drivers Association, which is losing drivers to Uber, prominently offered condolences to Sofia’s family on its website. “Uber may be the next Amazon, but Amazon doesn’t have the same potential capability to leave a trail of bodies in the street,” Trevor Johnson, a director of the association and a driver himself, wrote in an email. Mr. Kalanick declined to comment about this episode, and shortly afterward, ended the interview. David Krane, who last summer led a $258 million investment in Uber by Google Ventures, was full of admiration for Mr. Kalanick and what he called his “superpowers,” including his attention to detail. “I know very few chief executives that on New Year’s Day would answer 100 customer service inquiries in public,” Mr. Krane said. I think the head of the cab association has a good point. When a company in the digital arena arrives on the streets or in people's homes or businesses to deliver goods or services, it enters into different kinds of business risks. It would be a good idea to train the CEO of such a company in the basics of person-to-person communication. I know too many people of the digital age who say, "Well, email and texting are a more efficient way to communicate." Let's remember that empathy is the most powerful communications tool, one that most often has to be displayed in person. As we wait for the Board of Trustees of the University of Illinois to indicate whether they plan to investigate the various ethical issues surrounding the recent usurpation of the University of Illinois name and reputation, it is illustrative to look at other aspects of financial dealing between high-ranking University officials and private firms. As state employees, these folks file annual disclosure forms with the Secretary of State, and the information I summarize here is taken directly from those filings. I don't have time to go through them all, so I will focus here only on one person. The Dean of the College of Medicine is required by the University's research processes to sign off on financial disclosure forms and manage and mitigate any potential conflicts of interest. The Dean indicates on his own annual state forms that he is on the board of Novartis, self-styled as "one of the highest-ranked pharmaceutical and healthcare companies by sales in the world." He also receives consultant fees from Forsight Labs and Alcon Labs, a Novartis company. Would your family and friends think it was ethical for a Novartis board member who oversees a large portfolio of research at a university, including research related to the areas in which Novartis and its competitors conduct business, to make determinations of whether researchers in that school are infringing on conflict of interest standards? Would the answer matter if a portion of that person's own research and educational funding or consultant fees or honoraria had come from that company before becoming Dean? Would you be comfortable reading about that relationship in the media? Please understand that I am not suggesting that this person has done anything illegal or that he is personally immoral. Indeed, the facts presented above are those filed by him in the state documents. But what message is sent to other doctors by this affiliation? Does it send a clear signal of high ethical standards, of the need to protect the University's excellent clinical and research programs from possible disrepute? The salaries paid by the University are set by the Trustees to be sufficient, in and of themselves, to attract world-class people to work in leadership positions. When deans ultimately step down from their jobs, they are viewed as extremely attractive candidates for health science company boards. Why not just wait a few years to cash in, when there is no likelihood of sending the wrong signal throughout your faculty? Curious observers have been asking me why someone at the University of Illinois would knowingly aid and abet an effort to use the University's reputation to support the commercial objectives of a private firm. I suspect that, when the facts come out, it will be about the money. But I am just speculating. Let's imagine the following scenario. A major manufacturer of medical equipment, which has succeeded in part by recruiting surgeons to be its spokespersons with the public and in medical conferences, finds that its place in the capital market is faltering. This may be a result of a number of adverse incidents related to the technology. It may be because the market for its machine has become saturated, and it is facing a harder time entering new market segments. Sell-side analysts aren't happy with the lack of revenue guidance offered by Intuitive Surgical (ISRG) after its Q4 earnings report. J.P. Morgan says the earnings call was a disappointment, and that the 2014 outlook is murkier than just a week ago. Morgan Stanley says its expectations for guidance were muted, but its below consensus 2014 EPS outlook is coming down another 10%. BAML says the stock remains Buy rated but investors must brace for another year of negative earnings growth. Canaccord says it wouldn't be buyers on weakness. This would be an opportune time to conduct a direct-to-consumer national marketing campaign, burnished by the reputation of a major academic medical center. Some people in that center have been participating in financial gain from the company in the form of "compensation from the company for providing education services to other surgeons and patients." Or, perhaps in other forms. So the company and those people decide to create an advertisement, loaded with people in white coats, to give the impression of an institutional endorsement of the company's product. Or maybe I have it totally wrong. Maybe it is an absolute coincidence that doctors who have been receiving compensation from this company have appeared in the advertisement. Maybe they posed for another picture, which was used without authorization by the company. Maybe they are totally innocent dupes. 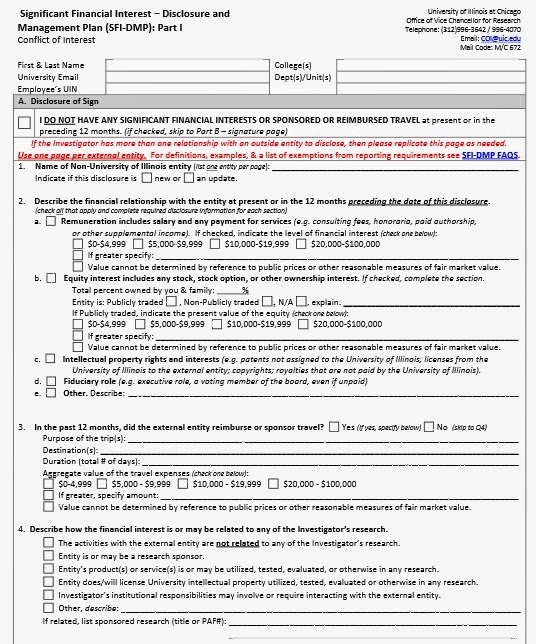 The University requires its researchers to file financial disclosure forms every year. Did the doctors referred to in the advertisement file these forms? Most, as researchers, are required to: Dr. Antonio Gangemi reports on LinkedIn that he and Dr. Pier C. Giulanotti "have started two main research projects aiming to develop guidelines for training and credentialing in robotic surgery." Dr. Enrico Benedetti lists extensive research activities on his UIC home page, as does Dr. Bernard Pygon. Questions to be answered: Are these forms a matter of public record? Since they are financial disclosure forms designed to promote unbiased research and encourage public confidence in the accuracy of research endeavors, we'd like to think so. What do they say? Is there any review of those forms by University compliance administrators? For that matter, does the University have compliance administrators who are charged with reviewing the accuracy of such forms? Is there any reconciliation between the dollars listed on the forms and the state tax filings of those individuals? After all, the University is a state entity and could require such a reconciliation. Explain four key principles that companies can use to better manage supply chain risks and prepare for future opportunities. He will also discuss how leaders can use this systems-based framework to better understand a company's position in the market relative to its competitors. 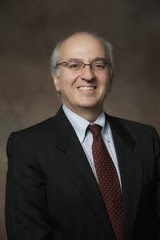 Enrico Benedetti is Head of the Department of Surgery of the University of Illinois Hospital and Health Sciences System. 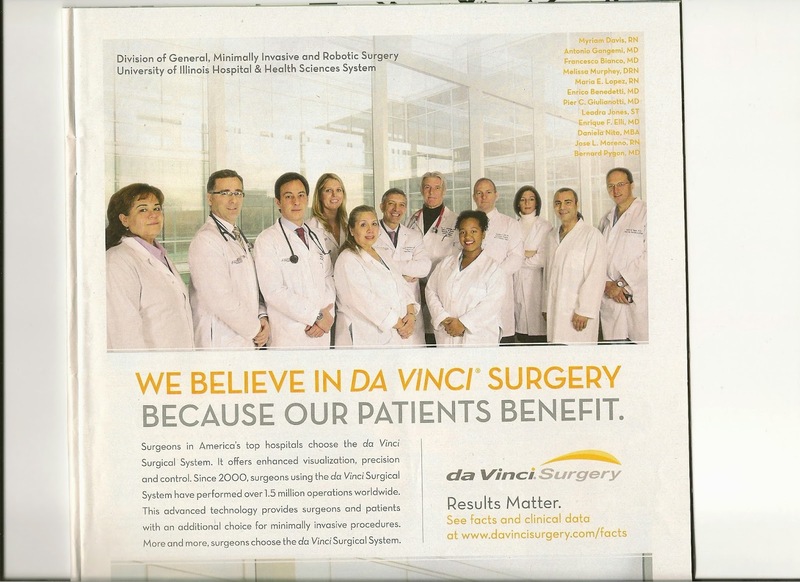 On January 19, 2014, Dr. Benedetti appeared in an advertisement in the New York Times Magazine that purported to represent the endorsement by the University of Illinois of the daVinci surgical system, manufactured by Intuitive Surgical, Inc. The advertisement, as I have noted, bears a copyright from Intuitive Surgical, Inc. and in, my mind, warrants extreme disciplinary action against the highest ranked clinical and administrative University officials who approved it. On January 23, 2014, Dr. Bernard Pygon was designated by the University of Illinois Board of Trustees to be Acting Chief Medical Officer of the University of Illinois Hospital and Health Sciences System, Chicago, renewing an initial appointment made on December 1, 2013. There is no reason to believe that Dr. Pygon is anything less than a highly competent and well respected physician. However, Dr. Pygon also appeared in the advertisement in the New York Times Magazine. The presence of Dr. Benedetti and Dr. Pygon in the advertisement, given their positions, raises important questions. Did they participate in the decision to use the image and the reputation of the University in service to a private corporation? How can this matter be cleared up to protect their reputations, if appropriate, or apply discipline, if appropriate? Although these are special cases given their positions, the same questions hold for all of the other doctors pictured and identified in this advertisement. All of this leads to a question of governance. Where is the Board of Trustees on this matter? In addition to approving medical staff clinical appointments, the board establishes the overall guidelines for behavior for the entire university system, a system that includes the Hospital and Health Sciences System. Will they open an investigation of this matter? When will they issue a statement to the people of the Chicago region telling of their plans, so as to re-establish trust in this major medical system? As we consider the growing discussion involving the capture of the University of Illinois' reputation to market the wares of a particular medical device manufacturer, we should pause and reflect how, in doing so, the manufacturer also denigrated the standing of clinicians. As doctors will tell you, the day they are granted their first white coat is a meaningful, indeed sacred, occasion. It is symbolic of their taking on a lifelong commitment to alleviate human suffering caused by disease. Other medical professions, too, wear the coat as a symbol of their commitment to the public good. The public, in turn, views that symbol as emblematic of that sacred trust. We look up to and respect people wearing the white coats. We know they have devoted themselves to our well-being and have engaged in extensive training for our good. According to the university web page, one of the 'team' members is the "Media and Administrative Contact." I confirmed this by viewing the site. I imagine this non-clinician was put in the advertisement in that garb to enhance the gender mix presented to the public. This is particularly important given the company's desire to expand the use of its surgical robot into the OB/GYN field, something that has received adverse publicity. Indeed, some uses of the daVinci robot in this field have been decried by the head of the American Congress of Obstetricians and Gynecologists. In mentioning this advertising technique, I mean to impose no blame on the person involved. After all, we don't even know if she knew how this picture would be used by Intuitive Surgical. Clearly, some senior clinical leader the University of Illinois was responsible for this ad. The idea that any such person would add to his or her other Code of Conduct violations by permitting a degradation of the sacred trust inherent in the wearing of a white coat--especially in support of a commercial enterprise--is a sad statement about that person's moral code. Regular readers know that I tend to operate in a no-blame mode, i.e., be hard on the problem and soft on the people. But when someone has violated the public trust in an institution to support the commercial goals of a private company, they have shown such poor judgment that consideration must be given to terminating their employment. Today's example is the following advertisement, which appeared in the New York Times Magazine this past weekend. So far so good: A hospital is bragging about a technology it has in place to serve its customers. This happens all the time. While we might question the efficacy of an advertisement for the University of Illinois in attracting customers from across the United States, that is less a question of ethics than one of business judgement. Perhaps you have trouble seeing the small print, but the tag line is that the copyright on this advertisement is held by Intuitive Surgical, Inc., the manufacturer of the daVinci robot. Just above that we have a disclosure that "some surgeons who appear in this ad have received compensation from the company for providing educational services to other surgeons and patients." Wait a second. Whose ad is this? If it is an ad paid for by the University of Illinois, why doesn't the University hold the copyright? If the ad is paid for by Intuitive Surgical, Inc., how can the University allow its name to be used for commercial purposes? Compliance by following State and Federal laws and regulations and University policies related to their duties and responsibilities. 1) The University has allowed its reputation to be used in a nationally distributed advertisement produced and owned by a private party, in benefit to that party's commercial objectives. This is not consistent with "exercising custodial responsibility for University property and resources." 2) The information presented under the University's imprimatur is not "reliable and dependable" and therefore undermines the trustworthiness of the institution. 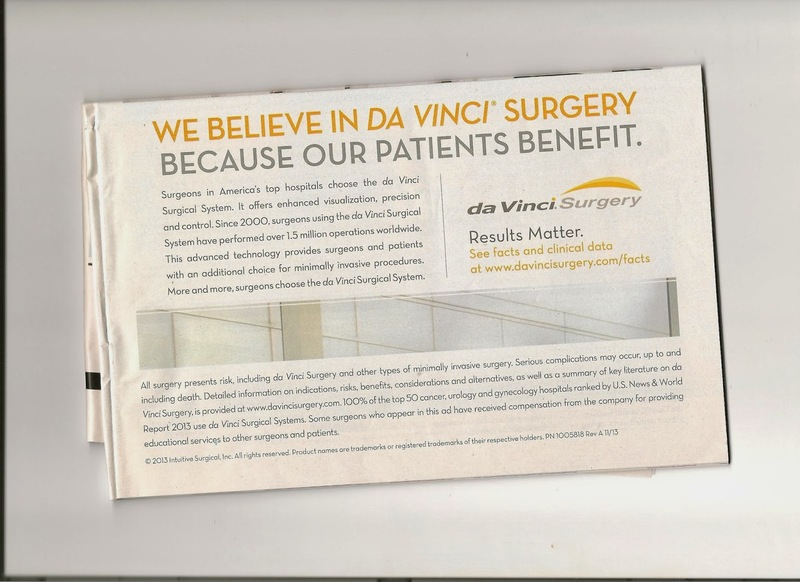 I refer especially to the assertion: "See facts and clinical data at www.davincisurgery.com/facts." This website does not contain the results of objective peer-reviewed, case-controlled data comparing robotic surgery to manual laparoscopic surgery--the expected research standard for academic medical centers. Instead, the site leads to a document that asserts: "Over the past decade, hundreds of studies have been published on the use of the daVinci Surgical system demonstrating improved surgical outcomes when compared to open surgery." Imagine the disciplinary action that would follow if a professor in the university had attempted to publish such self-serving information in support of his or her scientific hypotheses and label it as "facts." 3) The inclusion of a surgery technician and nurses in the photograph raises concern about the idea of "treating others with civility and decency." What was the process by which those people were invited to participate in the ad? While it might be based on affection and respect for them as part of the surgical team, were they given a choice? Were they inserted in the picture to give an impression of greater gender and ethnic diversity? If some of the participants in the photograph have received compensation for their commercial activities, were these staff members treated equally? 4) On the compensation issue, there is no disclosure as to which surgeons have been compensated by Intuitive Surgical, Inc., the nature of the work they did to receive that money, and the amount of money involved. Again, the issue of trustworthiness arises. So, who should be fired for these violations? Simple: I would choose the highest-rank administrator and clinician who gave permission for this advertisement to be published. I need your help in evaluating this story. Is this what I should hope for when I advocate for patient-driven care, or is this an example of over-use in a hospital? I'm really not sure, and I'd welcome your thoughts. The story is of a 10-year-old boy who has a fever. He is taken to the local urgent care center at 9:00am. The family is told that the center cannot disburse medication and that, in any event, since the child's temperature is 102 degrees, he should be taken to the emergency room of a hospital in the neighboring community. [P]rovide emotional support for children and families. They cover the inpatient service, operating room and Pediatric Emergency Department. Child Life is active in preparation and procedural support for children undergoing testing and procedures as well as providing support to children and their families. At some point, the specialist asks the child if he would like to watch a movie. He says yes and is presented with a five-page listing of videos from which he can pick. He chooses one to watch on the television screen. Meanwhile, he is also loaned an iPad, on which he can play games. 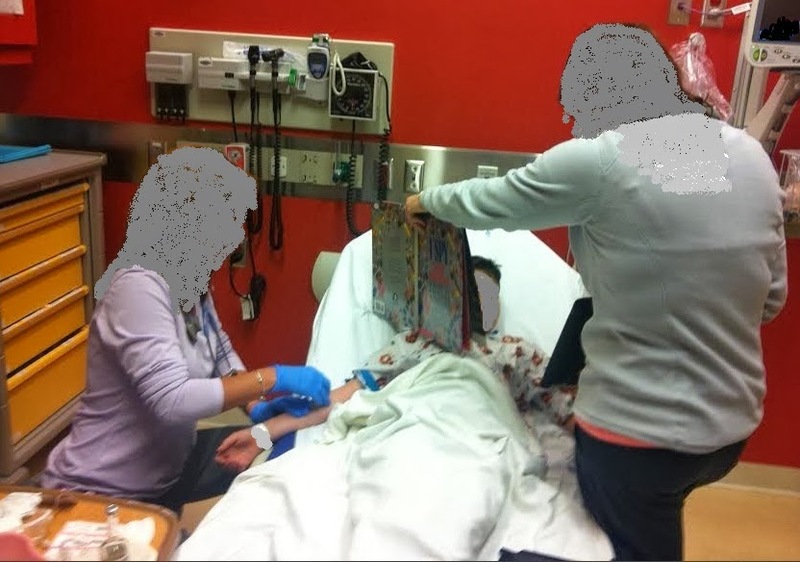 When it comes time for a nurse to insert an IV port, the child life specialist shields the child's eyes from the procedure with a book, while he continues to watch the movie and the iPad. Here's the scene. Eventually, at 3:00pm, the boy is discharged with a diagnosis of a fever of unknown origin and instructions to take medication to reduce the fever. The parents, while greatly appreciative of the demeanor and expertise of the staff, were stunned at level of costs that would be required to deliver this kind of care. They were perplexed as to why their son needed it. Give this book to your college senior in January . . .
. . . so s/he won't move back home in June! 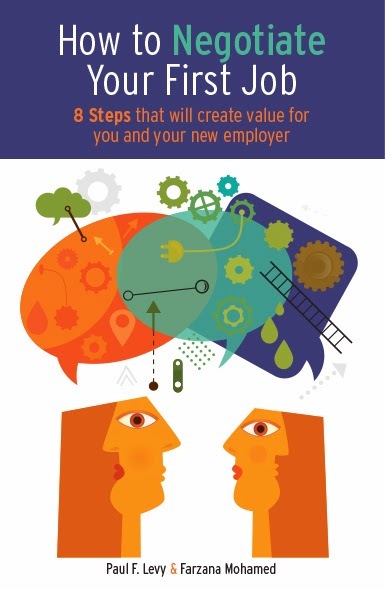 I am pleased to announce the publication of our new book, "How to Negotiate Your First Job." My wife, Farzana Mohamed, and I wrote it to help college graduates plan for their first important negotiation--the terms and conditions of their employment. In advising many college students, we have found that new entrants to the job market are remarkably unlikely to negotiate the terms of their first job. Whether fearful of losing an offer, or just unsure what to say or do, this is understandable. In the book we set forth sound negotiation principles, but we explain them in plain terms and give many examples of how to conduct a negotiation that will get a better deal for the job seeker--but will also leave the employer feeling even more satisfied that they have hired this young person. In one chapter, too, we address the well documented fact that women do worse in job negotiations than men; and we offer some suggested remedies to that phenomenon. 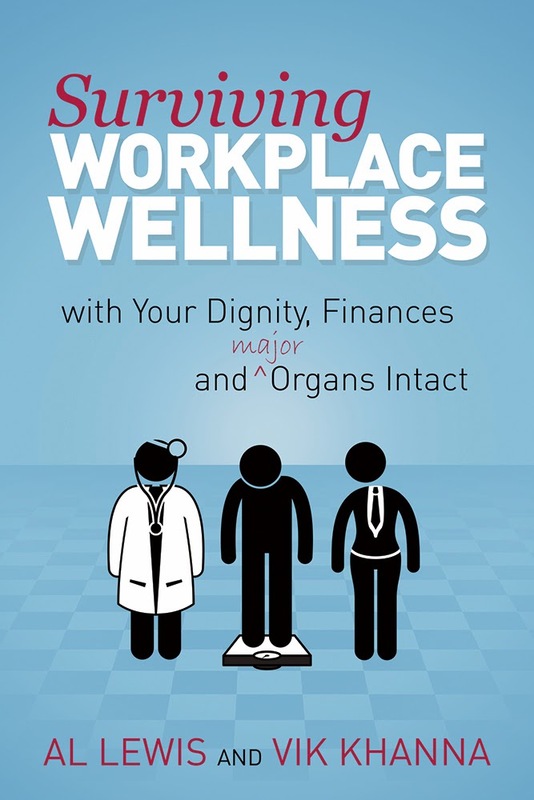 If you have a college-aged person in your family, or know of a person just entering the work force, please consider purchasing this book as a gift. We are also happy to hold workshops for students at colleges and universities based on the principles and stories from the book. If you know of any schools that might be interested, please let us know at advice [at] negotiateyourjob [dot] com. Here's the link on Amazon for both the paper version and Kindle. Other eBook formats (Nook and the rest) will be available soon. Boston area folks can find the book at Brookline Booksmith, Wellesley Books, New England Mobile Bookfair (Newton), Back Pages Books (Waltham), and Harvard Bookstore (Cambridge). I can already predict the result. The New York Times publishes a story about the rise in specialists' incomes, much of which is based on procedures they carry out. Outrage follows, and health care public policy experts say, "You see, the solution is to move away from fee-for-service medicine and towards capitated, or global, payments." Sure, that's one answer, but not one that will solve this problem. Medicare’s valuation of physicians’ services is based on a complex algorithm that is intended to take into account the time and skill required to perform a medical task, with an adjustment made for a specialty’s malpractice rates. Primary care doctors — who make up only 12 percent of physicians in practice — say they have little clout, with at most five representatives on the panel. “That committee keeps the perverse incentives in place,” said Brian Crownover, a family physician from Boise, Idaho. This is not news. The Wall Street Journal described this in detail in 2010. Yet the influence of the secretive panel, known as the Relative Value Scale Update Committee, is enormous. I would like to make a simple proposal to President Obama, Secretary of HHS Kathleen Sebelius, and CMS administrator Marilyn Tavenner. Keep the RUC but insist that all of its meetings and deliberations be made public. That is within the immediate power of the Executive branch, requiring no judicial review. This is an administration that has prided itself on transparency. Surely they can insist that one their key advisory panels, one that will help determine the success or failure of health reform, should perform its functions in the open. Let’s shine some sunshine on the process and logic used. If the RUC’s methodology is sound, we will all learn from that. If it is flawed, the public outcry will make it change its ways. With health care spending soon to consume 20 percent of the GDP, this conference is meant to empower physicians-in-training to develop and execute high-value care projects in their hospitals and health systems, and equip medical practitioners with competencies to meet the challenges of a dynamic and rapidly changing healthcare delivery system. 11:45 AM High Value Prescribing: GOTMeds? There are other ways you can share your ideas, ask questions and participate. 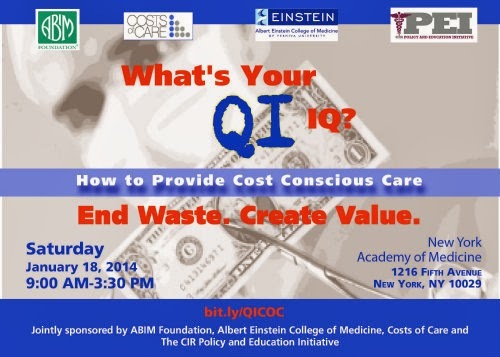 You can join the conversation by following on twitter at #QIIQ #teachingvalue #meded. Daniel Wolfson, MHSA, Executive Vice President of the American Board of Internal Medicine Foundation. Previously, Mr. Wolfson served for nearly two decades as the founding president and CEO of the Alliance of Community Health Plans (formerly The HMO Group), the nation’s leading association of not-for-profit and provider-sponsored health plans. During his tenure, Mr. Wolfson earned national recognition for spearheading the development of the Health Plan Employer Data and Information Set (HEDIS™), convening the RxHealthValue coalition to provide independent information on the pharmaceutical industry, and co-sponsoring with the American College of Physicians the journal Effective Clinical Practice. Neel Shah, MD, MPP , Founder and Executive Director, Costs of Care and a Harvard-affiliated ob/gyn who delivers babies, provides primary care and performs surgery. His writing, research, and medical practice have focused on deflating medical bills by helping caregivers make high value clinical decisions. Vineet Arora, MD, MAPP, Director of Education, Costs of Care, Director of GME Clinical Learning Environment Innovation. Dr. Arora is an expert at using novel methods, such as video vignettes and social media to promote clinician awareness and behavior change. In 2012, she was selected as HealthLeaders Magazine’s one of 20 people who make healthcare better. Christopher Moriates, MD, Associate Director of Education, Costs of Care. During residency training he co-designed and implemented a successful cost awareness curriculum for Internal Medicine residents, which has been highlighted in multiple publications including the New England Journal of Medicine. He also actively participates on the American College of Physicians’ (ACP) national High-Value, Cost-Conscious Care Curriculum committee. A Washington, DC colleague reported to me this week that spending on lobbying in the nation's capital has declined considerably. Why? With current gridlock in Congress, legislation that is viewed as harmful by corporate, labor, or other interests is exceptionally unlikely to pass. So why spend money fighting something you don't really have to worry about? More than two-thirds of last year’s top 100 lobbying entities spent less on federal-level lobbying activity during this year’s third quarter than they did the year before, according to a Center for Public Integrity of analysis of new congressional disclosure reports and Center for Responsive Politics data. Pharmaceutical behemoths, gun advocates and corporate agriculture interests are notable outliers. In all, 55 provisions of the Internal Revenue Code died an unceremonious death as the possum dropped last night, but understand – this is nothing new. The Code is about as permanent as a Kardashian marriage, with provisions routinely being written for a finite period, expiring, and then either proactively or retroactively being extended. It’s the worst business model imaginable – particularly because many of these short-term provisions were written specifically as business incentives, yet there tenuous nature makes it impossible for businesses to plan for them – but it’s a model that Congress has maddeningly embraced. So, why doesn't Congress just make things permanent? Obviously, if businesses, labor unions and others need to get laws extended, they will be much more likely to contribute to political campaigns. It would be electoral suicide, in terms of fund-raising, if provisions were permanent! So, look for an uptick in lobbying expenses. The next WIHI broadcast — Violence Prevention and Community Health — will take place on Thursday, January 16, from 2 to 3 PM ET, and I hope you'll tune in. We’ve just come through a holiday season that’s bittersweet for some — including families that have lost a loved one because of gun violence. Some incidents garner headlines more than others, due to the sheer magnitude of what’s transpired, the ages of the victims, the incredible shock to an otherwise quiet day in a quiet neighborhood, and the tragic consequences. For those in the trenches of working to reduce gun violence day to day — more often in communities and in health care systems all too familiar with gun-related deaths and injuries — every event stands out and has a story behind it. How can health care organizations, the very ones that often receive the victims through the doors of their EDs, be more effective partners and leaders further upstream? How can gun violence prevention become part of emerging strategies to encompass and focus on better population health? The January 16, 2014, WIHI: Violence Prevention and Community Health is going to highlight some exemplar thinking and initiatives now gaining traction, that everyone can learn from. WIHI host Madge Kaplan knows preventing and reducing gun violence is a huge topic. But the January 16 panelists will offer a lot of great, actionable ideas, and you can help make this show concrete and inspiring as well by sharing your work and experiences. Please tune in! Note: I am not offering investment advice. I am not qualified or registered to do so. The Boston Globe's Robert Weisman offers a summary of a presentation made by Partners Healthcare System at the annual J.P. Morgan Healthcare Conference. This is an audience of investment people who are trying to keep up with trends in the health care industry and who advise clients on whether or not they should buy bonds. Weisman notes, "The Partners presentation in San Francisco came days after the massive hospital and doctors system disclosed it will sell $425 million worth of bonds to finance new construction and other expansion initiatives." As you would expect, the PHS made optimistic projections about its future, and I have to agree: There is little on the horizon that would interfere with Partners' ability to service its debt. First of all, the company was able to persuade the governor and legislature that it should not be subject to rate regulation and that it should be allowed to keep all the excess revenues it has received over the years. Indeed, the revenue advantage that PHS has in its current contracts, relative to other provider organizations, is guaranteed by the new legislation. Secondly, even though the Health Policy Commission has raised doubts about the wisdom of PHS acquiring new provider organizations, like South Shore Hospital and Harbor Medical Associates, it does not really matter if the formal merger takes place. "Sarah Darcy, spokeswoman for South Shore Hospital, said the two hospitals have worked together since 2004 on providing a wide range of medical and surgical care. Among them are the Dana-Farber/Brigham and Women’s Cancer Center, the Breast Care Center, and a Harvard Medical School-affiliated surgical residency program at South Shore Hospital." Merger or not, those relationships will persist. The doctors trust one another. Patients and families are used to the referral patterns that have been established. Such relationships are not torn asunder by a failure to create a larger corporation with a common bottom line. Thirdly, the likelihood that a competing force will arise in the region is small, in that there are a multitude of obstacles standing in the way. Even if mergers occur that create a "book-end" to Partners, it will be years before that entity will be an effective competitor, given the many cultural and logistical challenges. And, if it becomes an effective competitor, the state is highly likely to move into a duopoly situation, protecting the revenue streams of both entities. My impression is that health care leaders in the state government are afraid of hurting the golden goose called Partners (as was said by others an important part of the local economy), so they have deliberately limited how big a price incentive that insurers could give to lower priced hospitals in tiered and limited networks to prevent to large a loss of market share too quickly. But the reverse has happened. Over the last few years state healthcare leaders have gradually allowed the financial incentives to increase with little noticeable effect on market share - in fact the market share of the highest cost hospitals like those of Partners and Childrens has increased at the same time as tiered and limited networks were introduced. Whom do I call to get some of those bonds? I never wish any one bad luck, like losing a job. But in this case, I am happy to see it happening because it is an indication that there is hope in the battle against the medical arms race when people in the medical profession stand up for what is right. ISRG laid off 7% of its sales force recently; more details are expected this week. Layoffs were focused in GYN, where growth has slowed. At a time when there is a demand for more fiscal responsibility and transparency in health care, the use of expensive medical technology should be questioned when less-costly alternatives provide equal or better patient outcomes. A study of over 264,000 hysterectomy patients in 441 hospitals . . . found that robotics added an average of $2,000 per procedure without any demonstrable benefit. Aggressive direct-to-consumer marketing of the latest medical technologies may mislead the public into believing that they are the best choice. Our patients deserve and need factual information about all of their treatment options, including costs, so that they can make truly informed health care decisions. Patients should be advised that robotic hysterectomy is best used for unusual and complex clinical conditions in which improved outcomes over standard minimally invasive approaches have been demonstrated.